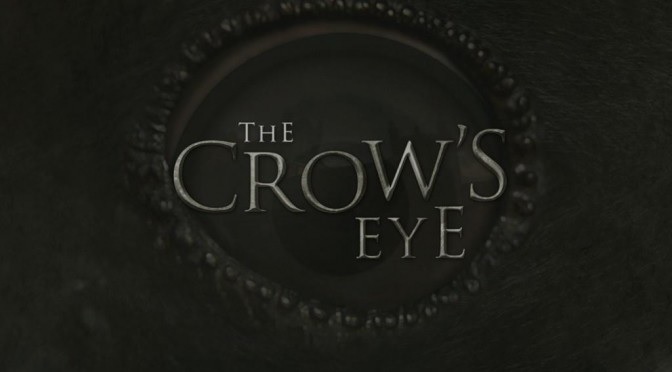 The Crow’s Eye is a psychological horror game that turns into Portal about halfway through its runtime. That’s not a negative statement, it’s a literal one – how else do you describe a series of linear puzzle rooms that you solve using a combination of physics blocks and a magic gun while an unseen antagonist forces you to keep going while mocking your efforts? Still, there’s nothing wrong with taking inspiration from the best, and despite its obvious origins The Crow’s Eye is a dark and twisted puzzler that, at time of writing, stands as probably the most thoroughly engrossing game I’ve played this year. If you’re expecting a true horror experience, look elsewhere. But if you’re looking for an entertaining, story-focused first-person adventure game, this needs to be an immediate addition to your wishlist. In The Crow’s Eye, you wake up with no memory in Crowswood University, a medical school. The school, as such things are in these games, is completely abandoned, and the bits of it that haven’t already crumbled into rubble are falling apart. Your only point of contact is a man you’ll come to know as William Holtwick, a man who looks like Rutherford B. Hayes and sounds like Mark Himill’s Joker. 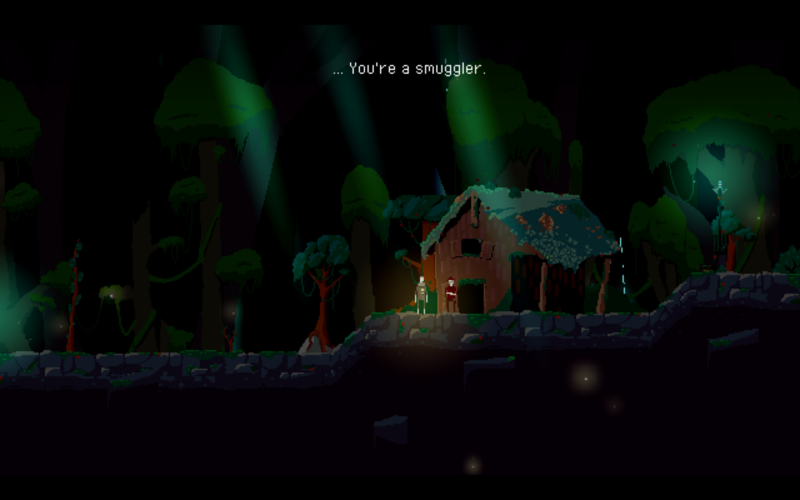 Holtwick can’t seem to decide whether or not he’s helping you escape or focring you to complete a series of experiments, and as you collect letters and audio logs you’ll begin to piece together the horrible history of Crowswood. The writing, admittedly, isn’t quite as good as it thinks it is. Dialogue is often clunky, rather than witty, and you’ll see most of the major twists coming long before they actually arrive. And while I quite liked the voice acting in general (Holtwick in particular is a cackling treat, his manic energy a major part of what makes the story work) Robert Kansas, a character who becomes very important towards the end of the game, sounds like he’s reading all his lines off of a script he’s just been handed. Taken as written he’s the emotional heart of the story, a complex character who doesn’t know where his allegiances lie, but the actor absolutely does not sell the part. And yet, I quite liked the story. 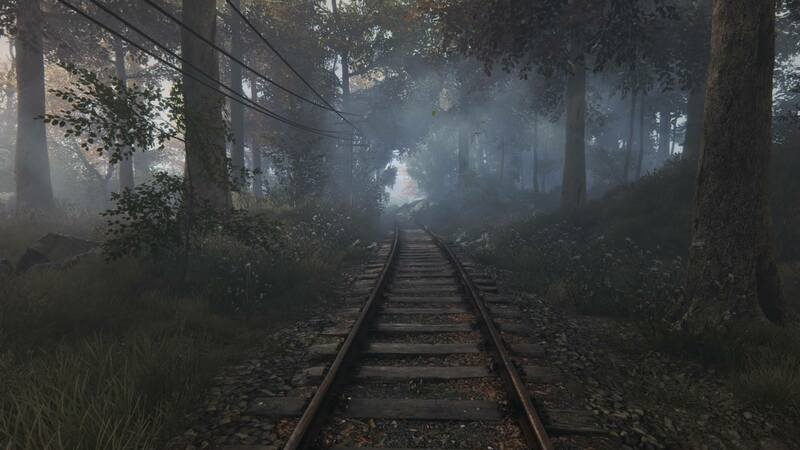 Sure, as adventure games go it’s no Walking Dead, but not everything needs to be. And The Crow’s Eye‘s story is elevated by an absolutely fantastic sense of atmosphere and pacing. 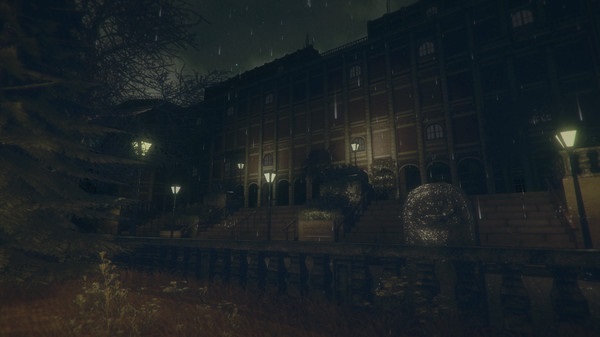 Despite the cliched premise around it (amnesiac wakes up in a scary abandoned building and has to escape), Crowswood University doesn’t really feel like the location of any other horror game I played. While it’s clear that something major happened here, it’s not trying to shock you with buckets of blood and gore. 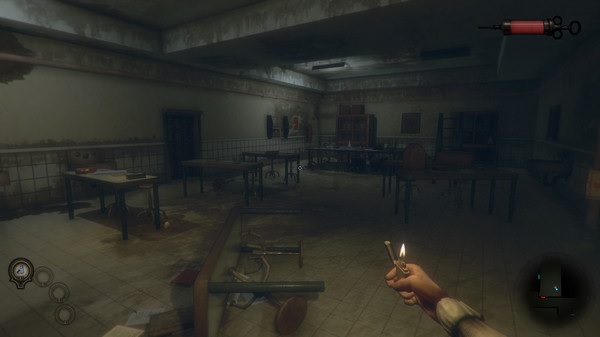 Instead, the tension is built through more subtle details – desks that look like they were very recently in use, an operating table that doesn’t look quite right, water that kills you instantly, the game’s insistence that you learn how to make your own bandages. As you learn more about what’s going on, you go through more and more surreal areas of the campus, until the idea that this ever could have been anywhere normal is preposterous – Crowswood is deeply, fundamentally a place of evil. And the music. Crow’s Eye‘s sound design earns the term “cinematic” – not only is the score brilliant composed, but it is synced so perfectly to what’s happening onscreen that it really does feel like your own personal soundtrack. You can buy the music on the Steam store page, but to be honest, I’m not sure it would have the same impact outside of the scenes it complements so well. The game isn’t survival horror in the traditional sense – there’s infinite stamina, infinite flashlight, and plenty of health items, so you never feel like you’re really in mortal peril. Plus, there’s only one jumpscare, although I’d argue it’s one of the most effective the genre’s ever seen (in large part because there’s only the one, so I wasn’t expecting it, and I spent the rest of the game wondering when it was going to come again.) But the game still does an excellent job of making you feel tense and worried throughout – like Pathologic, it’s a game about being trapped that actually makes you feel trapped. You won’t scream, but you might have trouble getting to sleep. 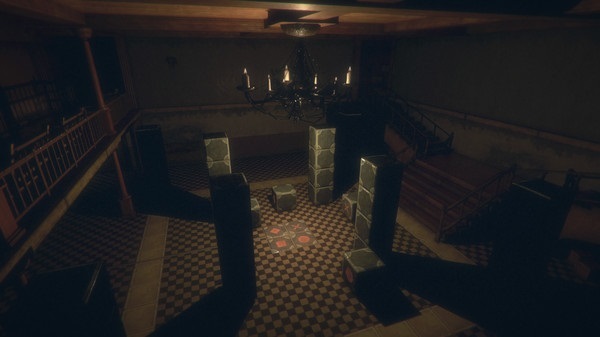 But like I said, the game’s not really about horror – it’s about puzzles. Crow’s Eye‘s gameplay is a unique mix of point-and-click adventure game inventory stuff and physics-based platforming a la the aforementioned Portal (although the electromagnetic device you eventually get is honestly more reminiscent of Half Life‘s gravity gun.) The more traditional point-and-click gameplay is by far the worst, particularly in the first section, where the game hasn’t introduced any of its more interesting mechanics and every puzzle is essentially just searching large rooms for the single interactive object. I did, indeed, occasionally have to resort to clicking on everything until the game progressed, and if that sort of point-and-click gameplay has never held your attention then The Crow’s Eye probably won’t either. Some of you may have already skipped ahead and may not understand why I gave this game the equivalent of a 7/10 considering my high praise. Part of that’s because of the flaws I’ve already mentioned – the competent story, the frequently unintuitive inventory puzzles. Everything in this game works, and frequently it works very impressively, but it’s all far from perfect. It’s the sort of game those of us who already like the genre and who are used to its quirks will adore and everyone else will find maddeningly obtuse. But another part of that is because the version I played had quite a few technical issues. 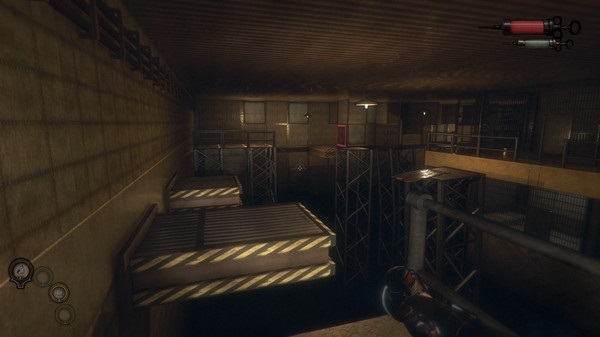 To a certain extent, I can forgive things clipping through the floor, or the framerate slowing to a crawl in a scant handful of rooms that had many moving parts (often rooms with running water.) But the real kicker is that, for reasons I cannot possibly understand, the button to active Adrenaline would often just stop working completely. Adrenaline slows down time around you, allowing you to crawl through fast-moving fans or make longer and more difficult jumps – an essential part of gameplay that often just wouldn’t activate no matter how many times I pressed the “C” key. The only fix I found was to quit and reload my last save, and while save points are common enough that I never lost very much progress, nothing breaks that all-important atmospheric tension like having to wait through a loading screen. Hopefully this bug will be fixed by launch or shortly after – if it is, consider my score effectively half a point higher. But even as it stands, The Crow’s Eye is still an absolutely enchanting game. The fact that a bug that serious could exist and only slightly hamper my enjoyment of the game should be testament enough to that. If you’re a fan of first-person puzzle games and have been disappointed by the lack of true genre gems in recent years, then The Crow’s Eye is for you. 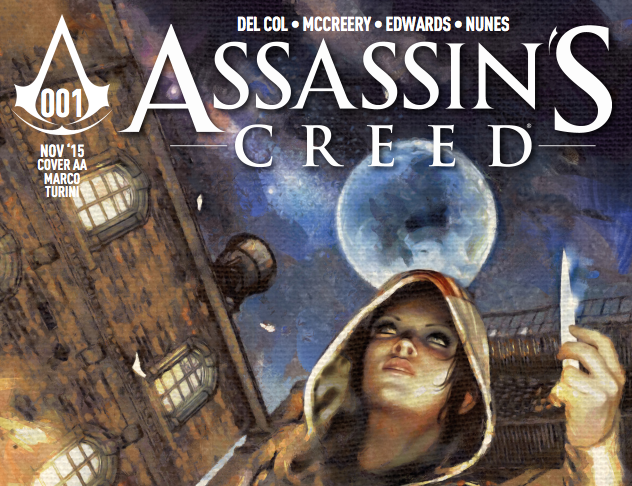 Full disclosure: This review is based on a review copy of The Crow’s Eye given to HeyPoorPlayer by the publisher.